Equipped with a 6.7-liter Powerstroke V-8 and reinforced frame, the F-250 is a perfect fit for emergency services crews. When looking at the Ford F-250 Super Duty, most people think of one thing: a workhorse that will likely outlive you. A seasoned veteran at reaching north of 250,000 miles, the F-250 has been a poster boy for work trucks. Strapped with a 6.7-liter Powerstroke diesel V-8 and a high-strength steel frame, this truck is meant to work—hard. The turbocharged, 6.7-liter diesel eight-cylinder produces 440 horsepower and 925 lb-ft of torque, and is coupled to a six-speed automatic transmission, perfect for continued pulling, hauling, and heavy acceleration. The middle frame rail cross sections on the F-250 are 9 inches by 3.5 inches—drastically thicker than the Silverado HD and Ram HD competition, and you can feel that increased rigidity in the ride. The F-250 also utilizes an aluminum-alloy body for a 350-pound weight reduction over the previous model. When looking at the interior of the Lariat trim, you can see plenty of welcomed features, but no unnecessary frills. The truck is meant to get the job done as a trusted work vehicle and Ford built it to look the part. With six auxiliary features on the roof, laborers, emergency responders and other hands-on professionals don’t have to spend money retrofitting the cab for additional lighting. Rather than just writing about how this truck would fare among emergency responders (note: I'm an EMT-B) I took the 2017 Ford F-250 Lariat to Eastchester EMS and asked the crew's opinion. Each emergency medical provider questioned had spent a fair share of his or her career inside a diesel truck, so it was clear they knew what to look for. After several laps around the truck, they all seemed to converge around one idea: “This thing will last.” Between the tried-and-true 6.7-liter diesel V-8, rubber floor mats, beefed-up suspension and drivetrain, and a corrosion-resistant frame, they all agreed the truck would hold up to a grueling life in the emergency services. 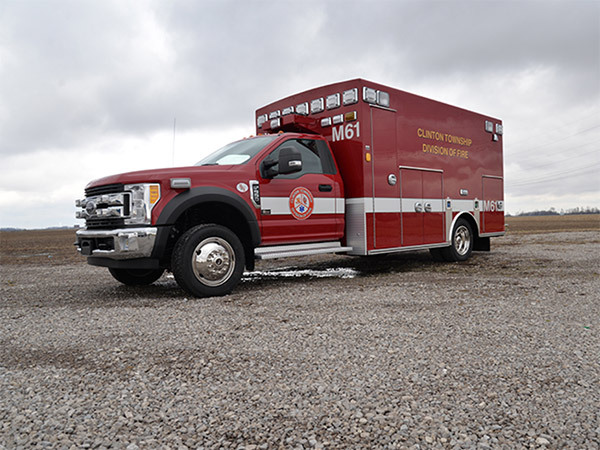 The F-250 / F-350 chassis is no stranger to the first-responder life; it can be found on Type-I ambulances, SWAT trucks, Brush trucks, and other quick-response vehicles. 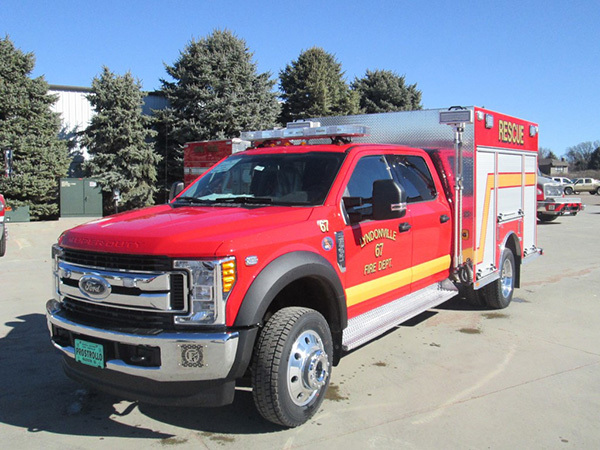 Over the past few months, departments across the country have been getting the newly designed F-250, F-350, F-450 and F-550s into their fleets, and it appears the boost in power and rigidity are welcomed by first responders. 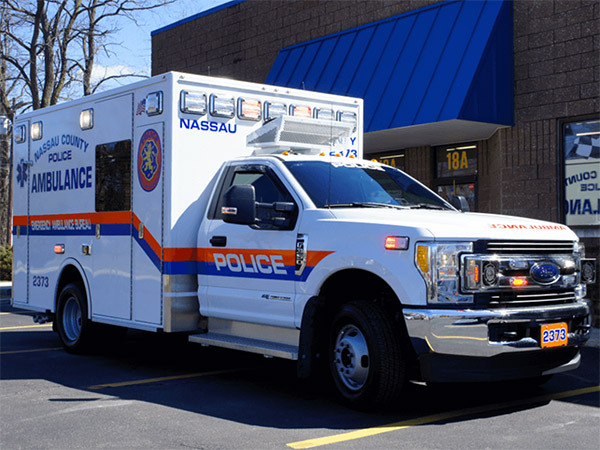 FDNY EMS has opted for the F-450 chassis to shuttle their new Type-I ambulances, and plenty of other departments are following suit. With a DRW (dual rear wheel) drivetrain, the Ford F-350/F-450 (with the same 6.7-liter engine as the Ford F-250) is easily able to handle a 12,000-to-14,000 pound ambulance. Thanks to the 750 lb-ft of torque (detuned to 330 hp and 750 lb-ft of torque for commercial chassis), first responders don't have to worry about whether or not their vehicle will be able handle the rigors of operating in an emergency situation while fully loaded with gear. Although 750 lb-ft of torque is far below the civilian 925 lb-ft of torque found in the 2017 Ford F-250, it is considerably more than the 660 lb-ft of torque that the 2016 Ford F-350's 6.7-liter diesel V-8 produced. In addition to performance and longevity, Eastchester EMS personnel noted the larger knobs and buttons on the center console and infotainment system were easy to use while wearing gloves, and found few features in the cabin that were easy to break. That second point is important; if you know anything about managing a fleet, you know that whatever can break off, will break off. There aren’t many downsides to the 2017 Ford F-250 diesel V-8, except for the price. The one we tested clocked in over $71,000—and that was far from top trim. The diesel engine alone cost $8,795, but if you're looking for power and reliability, this engine will do the trick. An XL-trim chassis will obviously be considerably less, but don't expect to find one under $40,000 without a government bid. The 2017 Ford F-250 was born to live a hard life, part of a fleet of emergency or construction vehicles or otherwise, but be warned: it will take a large chunk out of your vehicle budget. While getting a seat massage and toasting my hands on a leather-wrapped steering wheel. 663,475 miles, to be exact. The pumper does double duty for reduced operating cost and staffing. Hint: they aren't trying to slow down your coffee run. Both trucks will use an aluminum-alloy body, a 10-speed automatic transmission, and a 3.5-liter Ecoboost V-6.